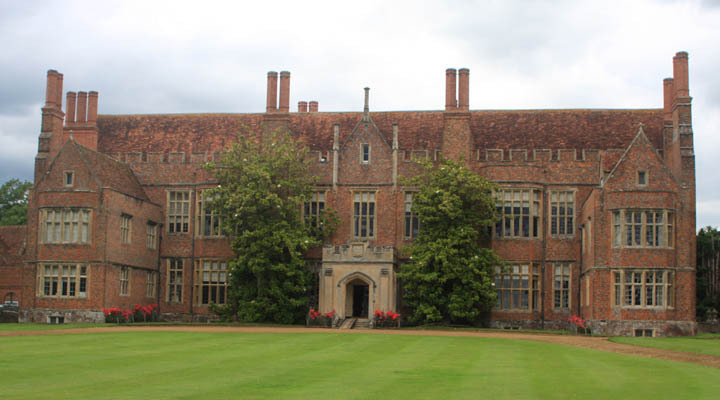 Today I paid a visit to Mapledurham House in Oxfordshire, the historic home of the Blount family and now the home of Jack Eyston, who is the senior member of the ancient Eyston family of East Hendred as well as the heir of numerous other old recusant families, including the Blounts of Mapledurham and Darells of Calehill. He has recently commissioned a version of his coat of arms with all 124 quarterings from the College of Arms. The reason for my visit was to inspect the papers of Mannock Strickland (1683-1744), a Catholic lawyer who served numerous recusant families and whose dealings with Continental religious houses are the subject of a forthcoming Catholic Record Society volume edited by Richard G. Williams, the archivist at Mapledurham at whose invitation I visited today. I was especially interested to see the chapel of St Michael at Mapledurham (1789) as well as the room which was previously the chapel, whose east end is two steps higher than the rest of the room (it is to be noted that the fourteenth-century Bardolf Chapel of the neighbouring parish church is also a Catholic mortuary chapel) . A portable altar disguised as a secretaire, now in the library, was probably located at the east end of the old chapel, which could be transformed from chapel to study at a moment’s notice. Jack Eyston kindly opened up the secretaire and revealed the altar stone, a tiny rectangular piece of slate covered in red damask, in the drawer immediately underneath the shelf intended for use as an altar. I am grateful to Richard Williams and Jack Eyston for the chance to visit Mapledurham and I look forward to working with Richard on my first project as CRS Volumes Editor. This entry was posted on August 5, 2015 by jacobite.